(TIM)>> HERE IT IS, THE LAST WEEK OF THE BUILD. IT'S WEDNESDAY MORNING I THINK BUT WE'RE IN HERE WORKING, WE'RE WIRING. SO WE'RE KINDA HOPING, MAYBE BY THE TIME WE GO TO SLEEP TONIGHT WE MIGHT HEAR A LITTLE VROOM, HOPING! END OF THE DAY FRIDAY WE'VE GOT TO HAVE IT RUNNING, AND MOVING, AND DRIVING, SO WE CAN ACTUALLY HAVE THE GUYS THAT ARE HERE FOR THE HAND CONTROLS SET AND DIAL THEM ALL IN SO THEY WORK AWESOME FOR CHAD. WE GOT SOME MEASUREMENTS, ELBOW LENGTHS AND ALL KINDS OF STUFF SO THEY COULD SET IT UP SO IT'S GONNA FIT HIM JUST PERFECT. 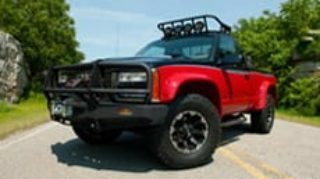 (ANNOUNCER)>> THE TRIFIVE STILL NEEDS ITS GLASS AND WINDOW MECHANISMS PUT INTO PLACE, AND MIKE MORGAN FROM DANCHUK MANUFACTURING IS JUST THE MAN FOR THE JOB BECAUSE DANCHUK SPECIALIZES IN TRIFIVE CHEVYS. SO MIKE'S BEEN AROUND A FEW OF THEM. (MIKE)>> THE '55, ONE OF THE CARS IN AMERICAN GRAFFITI. WHEN I WAS A KID I SAW THAT MOVIE AND THAT CAR JUST STUCK WITH ME. (ANNOUNCER)>> AND THIS '55 MAY NOT BE FOR HARRISON FORD, BUT HEY, HE CAN PROBABLY AFFORD TO BUILD ONE HIMSELF. (MIKE)>> I FEEL VERY HONORED TO BE CHOSEN. IT MAKES ME FEEL GOOD, I LIKE TO HELP PEOPLE. (ANNOUNCER)>> MIKE'S GONNA MAKE SURE THE CHEVY SEALS UP TIGHT WITH WEATHER STRIPPING FROM STEEL RUBBER PRODUCTS. (MIKE)>> THESE ARE MADE IN THE USA. THE RUBBER'S A LOT BETTER, IT LAST A LOT LONGER THAN SOME OF THE OTHER PRODUCTS MADE, AND IT SEALS A LOT BETTER TOO. (WILL)>> WHAT WE DO IS YOU CUT BACK A LITTLE BIT OF THE BLACK SHEATHING. (ANNOUNCER)>> TO GET FUEL TO THAT LS THREE WILL HANDZEL FROM TECH AFX IS HERE TO RUN SOME LINES. (WILL)>> YOU PUT IT IN THERE, AND CAN YOU GRAB THAT TAP THAT'S SITTING RIGHT THERE. I'M JUST TRYING TO GET FROM THE TANK TO THE ENGINE SO WHEN THEY TURN THE KEY EVERYTHING GOES TOGETHER. (ANNOUNCER)>> BUT SOMEBODY'S GOTTA WIRE THAT KEY, ALONG WITH THE REST OF THE CAR. (SCOTT)>> YOU HOLD THIS, HOLD IT RIGHT THERE. (ANNOUNCER)>> THAT SOMEBODY IS THIS FATHER/SON TEAM OF SCOTT AND KYLE BOWERS FROM RON FRANCIS WIRING. 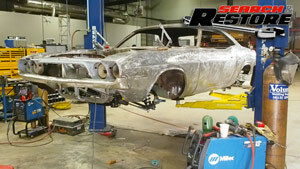 (SCOTT)>> WE OFFERED FOR THIS INSTALL A COMPLETE WIRING KIT. IT COMES WITH THE PANEL, ALL THE WIRES TO CONNECT ALL THE DIFFERENT EQUIPMENT, ALL THE ENGINE COMPONENTS, ALL THE LIGHTING, DASH, GET EVERYTHING WORKING LIKE THEY NEED TO BE IN A TYPICAL STREET ROD. (ANNOUNCER)>> ONE FAMILY HELPING ANOTHER, THAT'S WHAT THIS BUILD'S ALL ABOUT. OF COURSE BRINGING YOUR SON ALONG TO ONE OF THESE BUILDS MEANS YOU HAVE TO PUT UP WITH TIM. (TIM)>> SOME PEOPLE LOVE THEIR CHILDREN. WHY WOULD YOU LET YOUR KID GO OUT IN PUBLIC WITH A HAIR CUT LIKE THAT. (KYLE)>> YOU LOVE THAT MULLET OR WHAT? (TIM)>> ONCE AGAIN WE CALLED MIKE DANTES FROM ADVANCED AUTO GLASS TO INSTALL THE WINDSHIELD IN THE '55. 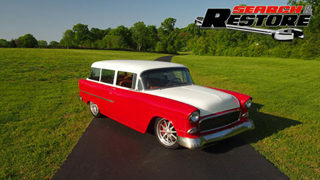 (MIKE D.)>> I'M GONNA INSTALL A BANANA IN A '55 CHEVY WAGON. WHEN I SAY BANANA I'M TALKING ABOUT THE WINDSHIELD CAUSE OF THE SHAPE, NICE AND CURVED. (TIM)>> THESE THINGS AREN'T THE EASIEST. THEY'VE GOT A RUBBER THAT GOES ON AND SOME STAINLESS THAT GOES ON, AND THEN IT GOES IN THE BODY. (MIKE D.)>> I'M MOVING IT BUDDY. (TIM)>> AND THEN YOU PUT MORE STAINLESS ON IT. SO IT'S PRETTY DIFFICULT. SO OUR MAN DANTES GOT IT HANDLED. DANTES, HE'S THE MAN. THERE'S SO MUCH STUFF GOING ON AND STUFF NEEDED TO BE PUT ON THIS CAR. EVEN ROBERT, THE CAMERA GUY, PUT HIS CAMERA DOWN FOR A LITTLE BIT AND HELPED. THAT'S PRETTY COOL! CHRIS KILL CAME IN FROM OKLAHOMA, FROM ADVANTAGE CAR AUDIO TO INSTALL A REALLY TOP NOTCH STEREO SYSTEM USING JL AUDIO COMPONENTS AND HE'S GONNA USE AN iPAD IN THE DASH. AND ON TOP OF THAT THE GUYS FROM HIX DESIGN MACHINED THIS REALLY COOL VOLUME KNOB. THEY PUT IT IN THE CONSOLE. (CHRIS)>> I'VE BEEN BUILDING SOME PANELS AND SOME SECTIONS TO MOUNT THE AUDIO EQUIPMENT. I'M TRYING TO INCORPORATE IT INTO THE CAR, NOT BE TOO INTRUSIVE. IT HAS A LITTLE COOL EFFECT TO IT, BUT AGAIN, MAINTAINS THE THEME OF THE CAR. GOES ALONG WITH EVERYTHING ELSE THAT'S THERE. (TIM)>> SO EVERYTHING ON THIS CAR IS A LITTLE BIT CUSTOM, EVEN THE DRIVESHAFT. NO JUNKYARD PARTS HERE, WE CALLED OUR FRIENDS AT DAN'S DRIVELINE OUT IN LAS VEGAS, NEVADA, GAVE THEM THE MEASUREMENTS. IT COMES ALL TOGETHER, UJOINTS INSTALLED, NEW YOKE, PAINTED EVEN, READY TO PUT RIGHT IN THE CAR, THANKS GUYS! (DWIGHT)>> IT'S JUST A MAD HOUSE IN HERE. 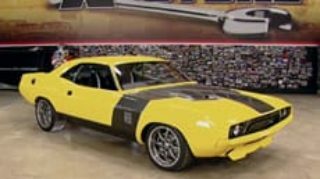 (ANNOUNCER)>> THAT'S RESTO MOD'S DWIGHT DOWEL, WHO CAME WITH A COMPLETE SERPENTINE BELT KIT AND AIR CONDITIONING SYSTEM FOR COMFORTABLE CRUISING. (DWIGHT)>> THAT MAKES ME FEEL REAL GOOD THAT WE'RE HELPING SOMEBODY, A CAR GUY, THAT'S GONNA APPRECIATE IT. IT'S IN HIS BLOOD, THAT'S JUST COOL ALL IN ITSELF. (ANNOUNCER)>> LATER IT'S A BIG DEAL WHEN CHAD AND HIS FAMILY ARRIVE TO SEE WHAT'S UNDER CURTAIN NUMBER ONE. BUT FIRST, PROBLEMS ON THE WAY TO THE FINISH LINE. (TOMMY)>> THERE'S A FEW THINGS THAT WE'VE GOT TO DO. PRIMARILY JUST WIRING, PUTTING THE INTERIOR IN IT, BUT CONSIDERING WHAT SHAPE THE CAR WAS IN THREE AND A HALF WEEKS AGO, WE MADE SOME SERIOUS PROGRESS. (TIM)>> THAT LOOKS AWESOME, CAN YOU ADD SOME HAIR? (ANNOUNCER)>> THE FARTHEST TRAVELED AWARD GOES TO BLAIR AND GRAHAM, WHO CAME IN FROM CHILLIWACK, BC, TO INSTALL THE SURE GRIP HAND CONTROLS FOR CHAD. (TIM)>> I WAS LIKE, HEY BLAIR, WE'RE NOT PUTTING THE HAND CONTROLS YET. YOU WANT TO BUILD THIS LITTLE FILLER THING FOR THE GAS? HE'S LIKE OKAY. I DON'T KNOW WHAT HE BUILT. SOME OF THE GUYS WERE CALLING IT FRANKENFILLER. A COUPLE GUYS THOUGHT IT LOOKED LIKE A SPACE WORM. EVERYTHING THAT YOU'VE GOT TO HAVE, YOU'VE GOT TO HAVE VENTS AND SOME EVAP SYSTEM FOR THIS MOTOR. SO EVERYTHING WAS PLUMBED IN THERE AND MADE. WE WERE GONNA PAINT IT. WE DECIDED IT WAS A LITTLE TOO PRETTY, SO WE SCUFFED IT AND CLEAR COATED IT. (ANNOUNCER)>> NOT ONLY IS BLAIR GREAT AT CREATING FUEL FILLER SOLUTIONS, HE CAN ALSO IDENTIFY WITH CHAD AND HIS DISABILITY. (BLAIR)>> IN MY 30'S I ALMOST ENDED UP IN A CHAIR. 22 DAYS IN THE HOSPITAL WITH BACK SURGERY AND STUFF. I WAS A SINGLE DAD AND MY SON WAS SIX AT THE TIME. THE STRUGGLE THAT, LIKE I SAID, DAY TO DAY, YOU KNOW. JUST SIMPLE THINGS THAT ABLE BODIED PEOPLE TAKE FOR GRANTED. THE GENERAL PUBLIC DOESN'T REALIZE, WHEN PEOPLE ARE IN CHAIRS, EVERY OBSTACLE THAT'S IN THEIR WAY DAILY, AND THEY OVERCOME THEM. IF THEY HAVE TO GO OUT, IF THEY HAVE TO GO DO THINGS. JUST EVERY SIMPLE LITTLE THING THAT WE TAKE SO MUCH FOR GRANTED THEY HAVE TO DEAL WITH EVERYDAY. YOU KNOW, AND THEY WORK HARD, THEY DEAL WITH IT, WORK REALLY HARD AT LIVING THEIR LIFE, AND IT'S A JOB. EVERY DAY, YOU KNOW, YOU DEFINITELY HAVE A RESPECT FOR PEOPLE WHO LITERALLY, MOBILITY IS SUCH A THING. (GRAHAM)>> WHAT WE DO IN OUR BUSINESS IS PROVIDE MOBILITY TO PEOPLE WHO ARE IN WHEELCHAIRS EVERY DAY. 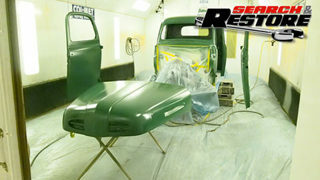 WE ARE WORKING ON A 1950 SUBURBAN AND IT HAS REAR ACCESS WITH POWER DOORS, POWER RAMP. 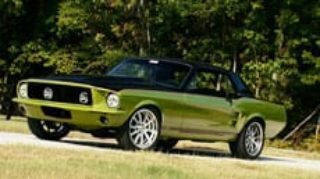 WE HAVE A LOT OF CLIENTS WHO WANT SOMETHING DIFFERENT, WANT TO BE IN THE HOT ROD GAME, AND THIS WE'VE COME UP WITH TO OFFER THAT TYPE OF CLIENT. 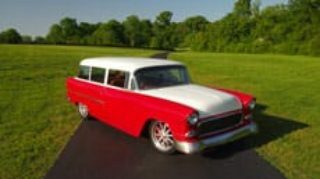 I'D LIKE TO SHOW YOU TODAY WHAT WE'RE GONNA INSTALL IN CHAD'S '55 CHEVY STATION WAGON SO THAT HE CAN DRIVE. WITH THE OLDER STYLE HAND CONTROL CHAD WOULD HAVE TO BE USING HIS ENTIRE ARM, ALL THE MUSCLES IN HIS LOWER ARM TO OPERATE THIS HANDLE FOR THROTTLE. WITH THE SURE GRIP DESIGN HE WOULD SIMPLY BE USING HIS WRISTS. ( )>> YOU'RE A CLOWN! (TIM)>> SO THE GUYS FROM BIG BODY INTERIORS AND THE GUY THAT RUNS THE SHOP, HE'S JUST KNOWN AROUND THE AREA AS BIG BODY. THEY DO SOME REALLY NICE INTERIORS. THEY'RE FRIENDS WITH HIX, AND WHEN HIX NEEDED A SHOP TO DO SOME STUFF OFF SITE, HE CALLED THEM. THEY WE'RE HAPPY TO HELP, AND THEY EVEN COME DOWN TO THE TECH CENTER AND HELPED PUT SOME STUFF IN THIS THING. (BIG BODY)>> YEP, THAT'S DONE. (ANNOUNCER)>> THE RADIATOR CAN GO IN FOR GOOD NOW, MARRIED TO A SUPPORT AND FANS PROVIDED BY AUTO RAD. (TIM)>> SO HERE WE ARE GETTING READY TO START THE ENGINE FOR THE VERY FIRST TIME. I GET REAL NERVOUS, I LOSE COLOR, I FEEL LIKE I'M GONNA THROW UP BECAUSE YOU JUST NEVER KNOW. [ engine starting & dying ] ( )>> WE'RE GONNA SEARCH IT FIRST. ( )>> HE WE'RE AT 94 ON THAT ONE. (TIM)>> SO IT KEPT STARTING AND DYING, STARTING AND DYING. I THOUGHT MAYBE THE COMPUTER WAS TRYING TO LEARN ITSELF, WHICH THEY HAVE TO DO. IT JUST DIDN'T SEEM LIKE IT WAS PICKING UP AND STAYING RUNNING. (JOE)>> DON'T KNOW FOR SURE YET, WE'RE DOUBLE CHECKING. MAYBE WE'VE JUST A COUPLE OF SPARK PLUG WIRES DOWN. (TIM)>> WE START DOING SOME TRACING. WE DID TAKE THE COILS OFF THE MOTOR. WE PUT THOSE DON HARDY RACE CAR VALVE COVERS ON THERE TO CLEAN UP THE MOTOR A LITTLE BIT. (JOE)>> IS THAT MAP INSTALLED CORRECTLY, OR IS IT UPSIDE DOWN? IS IT INSTALLED IN FLOW? IT'S GOT TO GO IN ONE DIRECTION. (JON)>> AIRFLOW NEEDS TO POINT TOWARDS THE THROTTLE BODY? (JON)>> IT'S POINTING THIS WAY. (JOE)>> COULD BE IT. ( )>> WATCH YOUR HANDS, HERE WE GO. [ engine firing and revving ] ( )>> THAT DID IT, HA, HA, HA! (TIM)>> SO HOW GUTSY ARE WE FEELING? ARE WE READY TO POP IT INTO GEAR? 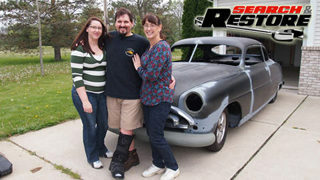 (ANNOUNCER)>> STAY TUNED FOR THE SHAKEDOWN RUN OF CHAD'S '55 CHEVROLET. ( )>> HOLY COW! (TOMMY)>> DON'T LOOK AT ME, LOOK AT THAT, IT'S MUCH BETTER. (TIM)>> THE VERY FIRST DRIVE, WE'RE GETTING READY TO TAKE THIS THING OUT OF THE BUILDING. I'M ALWAYS NERVOUS. EVERYTHING'S FRESH, EVERYTHING'S NEW, WE'VE HAD A LOT OF HANDS ON THIS THING. IT'S A LITTLE NERVE WRACKING. I'M GONNA TAKE JOE FROM PRATT & MILLER ON THE FIRST RIDE WITH US. MAN THAT DUDE WORKED WONDERS ON THIS THING. (GRAHAM)>> THAT IS A NICE CAR! CHAD'S GONNA BE CRAZY WHEN HE SEES THAT, IT IS BEAUTIFUL! (TIM)>> THEN AFTER WE GO TO THE CORNER AND BACK A COUPLE OF TIMES, WE'LL GET BLAIR IN, MAKE SURE HE CAN FINE TUNE ALL THOSE HAND CONTROLS SO IT'LL BE NICE FOR CHAD TO DRIVE. DO NOT LOOK TO THE LEFT SIDE OF THE DOORWAY. (BIG BODY)>> HOW YOU FELLERS DOIN'? (TIM)>> CHAD'S CLEAR COAT'S GONNA WANNA CURE FOR A COUPLE OF MONTHS BEFORE HE PUTS WAX ON IT, BUT WHEN HE'S READY HE'S GONNA WANNA USE SOME OF ARMOR ALL'S ALL NEW EXTREME SHIELD WAX. FOR AS MANY MILES AS WE PUT ON OUR TOW RIG, EXTREME SHIELD WAX LAYS DOWN A PROTECTIVE BARRIER THAT REPELS DIRT AND GRIME, HELPS MAKE SWIRLS AND MICRO SCRATCHES INVISIBLE, AND BEADS UP THE WATER SO MUCH CHAD'LL BE ABLE TO DRIVE HIS CAR DRY. CAUSE YOU KNOW IT RAINS LIKE EVERY DAY IN TACOMA, WASHINGTON. AND ARMOR ALL SENT ENOUGH PRODUCT TO KEEP HIM BUSY FOR A WHOLE YEAR. 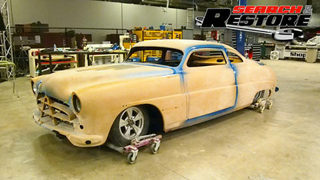 WE'RE GONNA FINISH OFF CHAD'S '55 WITH SOME ARMOR ALL WHEEL PROTECTANT. IT'LL LAY DOWN AN INVISIBLE BARRIER TO KEEP OUR BRUSHED BUDNIK WHEELS FREE FROM BRAKE DUST, ROAD GRIME, AND DIRT FOR UP TO FOUR WEEKS BETWEEN WASHES. WHEN I STARTED PLANNING THIS BUILD, LIKE I SAID, I'D BEEN AROUND A LOT OF TRIFIVES, AND THEY STILL DRIVE LIKE AN OLD CAR. 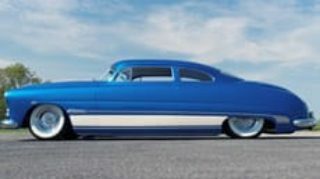 THEY DRIVE OKAY, BUT WHEN WE FOUND OUT THE STREET ROD GARAGE WOULD BE OPEN TO DOING A FULL CHASSIS FOR US WITH COIL OVERS FROM RIDE TECH, MAN I JUMPED AT THE CHANCE. I COULDN'T BE HAPPIER WITH THIS THING. (TIM)>> THAT'S A COOL THING ABOUT THESE TOYO PROXXIS FOURS, SOMETIMES YOU GET A TIRE THAT MIGHT MAKE A WHINING SOUND. YOU GET A STREET TIRE, IT ALMOST SOUNDS LIKE A FOUR WHEEL DRIVE TIRE, BUT THESE THINGS ARE QUIET, THEY STICK, THEY GET WARM, THEY STICK EVEN BETTER, HANDLE PRETTY GOOD. (ANNOUNCER)>> NEXT, THIS WORLD CLASS HOT ROD CHEVY IS REUNITED WITH HER OWNER. STAY TUNED FOR THE EMOTIONAL REVEAL WHEN SEARCH AND RESTORE CONTINUES. (TIM)>> SO HERE WE ARE, ANOTHER PROJECT, ANOTHER FOUR WEEKS OF REALLY HARD WORK. THANKS TO TOMMY AND ALL THESE VOLUNTEERS BEHIND ME PLUS SOME OTHERS, MAN, WE TOOK A CAR WHAT MOST OF YOU AT HOME PROBABLY WOULD'VE THREW AWAY, AND WE SAVED IT. IT WAS A TON OF HARD WORK, BUT MAN IT WAS WORTH. BRUSHED NICKEL TRIM, BILLET GRILL, HALO HEADLIGHTS, A BIG BUMPING STEREO, ONE OFF HIGH END STREET ROD INTERIOR, CUSTOM ENGINE COMPARTMENT WITH EVEN A LITTLE SPECIAL TOUCH FOR CHAD RIGHT ON THE VALVE COVER. THE SIDE TRIM'S DIFFERENT, FULL CUSTOM CHASSIS, STAINLESS EXHAUST, AND SEARS MANUFACTURING MADE SURE CHAD HAD A SWIVEL SEAT TO GO ALONG WITH REQUIRED HAND CONTROLS. (ANNOUNCER)>> FLYING IN FROM THEIR HOME STATE OF WASHINGTON FOR CHAD'S BIG DAY IS A SMALL ENTOURAGE. (DIANE)>> WELCOME, COME ON IN. HEY CHAD, COME ON IN HERE. WE'RE GONNA GO IN OUR CONFERENCE ROOM, HI THERE! WHAT ARE YOU EXPECTING HERE? (CHAD)>> NOPE, I KNOW IT'LL BE COOL WHATEVER IT IS. (DIANE)>> SO YOU LIKE TURQUOISE HUH? (TIM)>> BRING THEM ON DOWN. (DIANE)>> FANTASTIC, WE ARE HEADING YOUR WAY. (TIM)>> EVERYBODY, THIS IS THE TERHARS, CHAD, TASHA, PAYTON. TELL US WHO YOU BROUGHT. (TASHA)>> THIS IS MY MOM KIM. (CHAD)>> MY DAD JIM, MY BROTHER JEREMY, FRANK, JAMIE, JEFF, HIS WIFE LAURA, AND JEFF'S DAD, BOB. (TIM)>> THIS IS THE VOLUNTEER CREW. THIS IS SOME OF THEM THAT HELPED. SHUT DOWN THEIR BUSINESS, TRAVELED FROM ACROSS THE COUNTRY, REALLY STEPPED UP ON THIS PROJECT. WE PUT ALMOST 3,800 HOURS IN YOUR PROJECT. (TIM)>> AND IF YOU THINK BACK WHAT WE TOOK THAT DAY, YOU DIDN'T GIVE US MUCH. YOU GAVE US A LOT OF STUFF THAT WASN'T VERY GOOD AND WASN'T VERY USEABLE. ARE YOU EXCITED PAYTON? DO YOU HAVE ANYTHING TO SAY? WHAT DO YOU THINK IT'S GONNA LOOK LIKE? (TIM)>> WHY, I THOUGHT YOU WANTED IT LIKE PINK OR SOMETHING. (TIM)>> SO SHOULD WE STAND HERE AND TALK A LITTLE BIT MORE OR DO YOU WANT TO SEE DADDY'S CAR? (TIM)>> OKAY, UNCOVER THAT BABY TOMMY. (CHAD)>> OH MY GOD, WOW! OH MY GOD, LOOK AT THE BUMPERS, WOW! 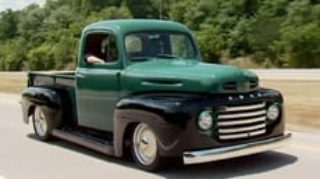 (TIM)>> WE FIXED THE QUARTER PANELS, WE PUT NEW DOORS, WE PUT NEW FENDERS, WE PUT FULL FLOOR, INNER AND OUTER ROCKERS, A REAR CARGO AREA. IT'S GOT ALL NEW GLASS, ALL NEW WIRING. IT'S GOT AIR CONDITIONING, IT'S GOT A TILT COLUMN, IT'S GOT AN AFTERMARKET CHASSIS. YOU CAN COME UP AND LOOK AT IT. WE DID THIS REALLY COOL POP UP MOTORCYCLE FILLER. (CHAD)>> OH THAT IS AWESOME! (TIM)>> GOT A JL AUDIO SYSTEM IN IT, FULL INTERIOR, HIX DESIGN. YOU WANT TO SEE THE ENGINE? WE REALLY NEVER TALKED ABOUT WHAT YOU WANTED FOR AN ENGINE, SO ME AND TOMMY MADE A FEW PHONE CALLS AND SO WE GAVE YOU THIS. 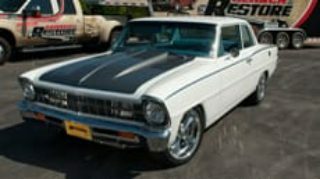 LS THREE CONNECT AND CRUISE, ALL FUEL INJECTION, OVERDRIVE ELECTRONIC TRANSMISSION. EVERYTHING UNDERNEATH HERE IS CUSTOM AND NEW. HAND BUILT FIREWALL, HAND BUILT INNER FENDER WELL. (CHAD)>> OH MY, LOOK AT THE VALVE COVERS! (TIM)>> A LITTLE TOUCH ON THE VALVE COVERS. (TIM)>> WE HAD A PICTURE AND DANNY TAYLOR COPIED THE EXACT LETTER STYLE, YOU LIKE THAT? (CHAD)>> I DON'T EVEN KNOW WHAT TO SAY, AND THANK YOU IS LIKE THE BIGGEST UNDERSTATEMENT. THIS ISN'T JUST A CAR TO ME. WHEN I'M IN A CAR, I'M NOT IN MY CHAIR, NOBODY SEES THE CHAIR. IT'S LIKE A CAR IS LIKE MY ABSOLUTE FREEDOM. IT'S AWESOME, I LOVE IT! (TIM)>> WANT TO COME AROUND AND LOOK AT THE INTERIOR WITH THE DOOR OPEN. (CHAD)>> LOVE TO, OH MY GOD! (TIM)>> WE CALLED THE GUYS AT SURE GRIP FROM CANADA, AND THEY CAME IN AND SET YOU UP WITH THIS TYPE OF CONTROL THAT YOU'RE USED TO USING WITH A LOT MORE SAFETY FEATURES. AND... WE ALSO DID THIS! WE PUT A SWIVEL SEAT ON IT FOR YOU, AND IT CLEARS THE CONSOLE. TASHA, WHY DON'T YOU GET IN THERE AND START IT UP. (TASHA)>> OH MY GOD, OH MY GOD! (ANNOUNCER)>> EARLY ON IN THE BUILD GOODGUYS PRESIDENT MARC MEADORS WAS SO IMPRESSED AT THE PROGRESS, HE DONATED THREE YEAR MEMBERSHIPS TO CHAD AND HIS FATHER JIM. TIME NOW TO HEAD OVER TO THE LIFT FOR A LOOK AT THE CHASSIS. (TIM)>> IT'S JUST AS PRETTY ON THE BOTTOM AS IT IS AT THE TOP. STAINLESS MAGNAFLOW EXHAUST, SIX PISTON WILWOODS, DUTCHMAN REAR END WITH A POLISHED NINE INCH. (TIM)>> PRETTY MUCH ALL THE SHEET METAL YOU SEE UNDERNEATH HERE IS ALL BRAND NEW. (MIKE A. )>> THE CAR'S PHENOMENAL. IF THAT CAR DOESN'T WIN AWARDS, NOTHING I'VE EVER BUILT IS GONNA WIN AN AWARD. 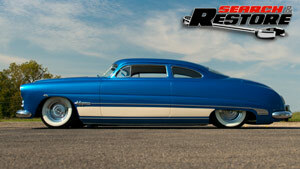 (JIM)>> WE'RE GONNA TAKE THIS CAR AND MY NOMAD AND WE'RE GONNA TAKE OVER A SMALL SECTION OF GOODGUYS. 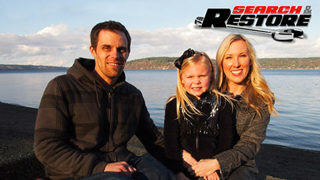 (JEREMY)>> YOU WORK HARD, IT'S AN AWESOME FAMILY, AND HE DESERVES THE BEST. YOU GUYS HAVE GIVEN THAT TO HIM, AND I COULDN'T ASK FOR MUCH MORE THAN THAT. (TASHA)>> WHERE DO YOU THINK WE SHOULD GO FOR OUR FIRST DRIVE? 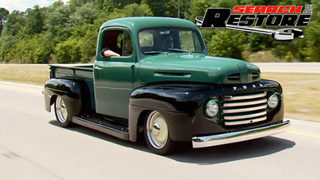 (ANNOUNCER)>> NEXT TIME ON SEARCH AND RESTORE, WE HEAD TO THE CITY OF BROTHERLY LOVE WHERE WE SURPRISE THIS CONSTRUCTION SUPERVISOR BY LOADING UP HIS FAMILY HEIRLOOM, A '48 FORD THAT SPANS FOUR GENERATIONS. (ANNOUNCER)>> VEHICLE DELIVERY PROVIDED BY PILOT TRANSPORT, INDUSTRY LEADERS IN MOVING YOUR PRECIOUS CAR, TRUCK, OR SUV ON TIME AND DAMAGE FREE.